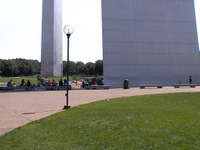 At the eastern terminus of our road trip, we visited the St. Louis Gateway Arch. It was such a "mainstream tourist" thing to do, but how could we not? We had driven more than 2,000 miles to get out here, and we weren't going to go home without seeing the city's most famous attraction. 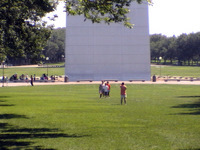 I've always thought of the St. Louis Gateway Arch being a whitish structure, but you know what? It looks a lot grayer up close. Approaching the arch on a tree-lined path. It was a typically muggy July day. If you're from a non-humid state and you visit St. Louis in summer, prepare to be more tired and sluggish than normal. To give you an idea of the scale, those are human beings out there. The Arch is absolutely immense. A funny angle in which you can see both ends of the arch at once. But they're actually quite far apart. Not what we were expecting! Alright, let's have a good look at ya, Archie. 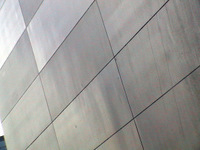 Wow, pretty gray and metallic looking. Was I the only one who expected it to be covered in a white porcelain-like coating? Not like a toilet, exactly, but you get the idea. It looks even darker against the sky. You can pay to take an elevator ride up in the arch, but we didn't want to wait in line with a 15-month-old. 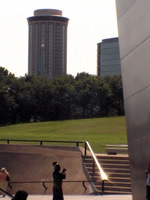 The St. Louis skyline behind the arch. It's a classic big-city skyline. St. Louis is no second-tier city. 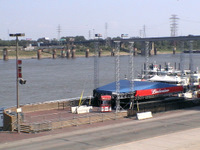 Did I mention that the arch is right on the banks of the mighty Mississippi? Well, it is. I believe that's the MacArthur Bridge, connecting St. Louis to Illinois. We actually made a wrong turn or two trying to get into St. Louis, and ended up back in Illinois. Check your maps and signs carefully. 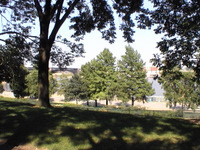 The arch is surrounded by a lovely recreational area with plenty of shady trees. This shattered another of my misconceptions. 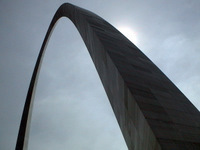 I pictured one end of the arch coming down behind an Arby's and the other in the parking lot of the TWA Dome. 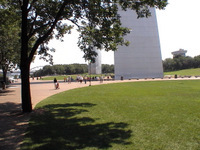 If you visit the St. Louis Gateway Arch, allow enough time to go up in the elevator. We can only imagine the view would have been magnificent. 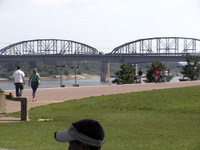 And you might want to visit in spring or fall, so that you can enjoy some outdoor time along the banks of the Mississippi River.